You are Edward Kenway, a Brit (Welsh, for those who are picky) from the bottom half of society looking for the means to create a better life for him and his wife. You have left her back in England with the intention of returning a rich and respected man. After many weeks, if not months, on the sea you find yourself shipwrecked on a desolate tropical island along with one other survivor. An assassin. The game is set in the early 18th century Caribbean, in and around towns such as Havana, Kingston and Nassau. Edward Kenway, the father of Haytham Kenway and grandfather of Connor, stumbles upon the assassin order by accident when he impersonates an assassin all in the name of money. On his journey he forms alliances with other pirates, learns of the Observatory and its powers, while starting his own fleet with the Jackdaw as his floating base. The story starts on the beach of a desolate island. Kenway has to locate the only other survivor, an assassin, who bolted into the jungle. You start running. But instead of following a learning tutorial that goes alongside the story, that has been the case in all other games of the series, the player is now put into the position of exploring to learn the moves on their own. There are still tool-tips on screen to help the player but it still feels odd not to have a learning sequence right at the start. The introduction to collectibles, such as shanties, animus fragments and treasure maps, is treated the same way. It is assumed that the player knows what the item is and what it is used for. As an example, it wasn't until well into Sequence 3, when I had acquired the Jackdaw, that I realized the shanties I had collected up until that point unlocked different sailor songs. The crew breaks out in song whenever the Jackdaw is not engaged in combat or during missions. The mini-map has gone through a makeover that not only looked too cartoon-like; it also displays animal icons that I initially thought was the location of an actual animal and not an indication of where a type of animal could be found. Not long after starting the game Kenway makes his way to civilization where he impersonates the assassin he previously met. The first city to explore is Havana and it is graphically pleasing. The amount of colours and rugged look brings back memories of Uncharted 2 and the exploration of the Nepalese villages. Havana is where we’re introduced to all the shops, assassination missions and rescue missions, to mention a few things. This is also where I first noticed a change in how the main character walks – or rather where he walks. Instead of walking in the middle of the screen he now walks on the left half of the screen. Such a small detail yet it drove me nuts! The missions have a good mix of stealth, speed and fighting. None of them felt too difficult and didn't require an obscene amount of tries to get them right. The only thing that I can truly complain about is the ridiculous effect Eagle-Vision has on enemies. A red, semi-transparent hue covers an enemy and makes them visible through walls. It is a very cartoon-like effect and doesn't go well with the overall graphics at all. Secondary objectives of missions are challenging as always, but unlike previous games in the series they no longer have to be completed all in one try. It is possible to focus on one objective in one mission play-through and another objective during a replay. Two thumbs up for that update! Crafting has returned to the game and this time the players get to craft their own weapon tools, certain ammunition and armour. The material for the items and upgrades are made from various types of animal parts, which are hunted all over the Caribbean. Some are found on land and others are harpooned from the Jackdaw. What shall we do with a drunken sailor, bird-eye in the morning? One of the biggest perks and most enjoyable feature in the game is in my opinion sailing the Jackdaw. It is by far the coolest thing to do, and I get goose bumps just thinking about it. The sea is huge. It takes hours to sail in full speed from one end to the other – no exaggerations. It is also very visually pleasing with various weather types. Sometimes the waters are calm, sometimes a storm takes shape with heavy rain and baby tornadoes, and sometimes a mist rolls in making it very hard to see anything in front of the bow. Strong winds forces the ship out of course and can cause issues when navigating through narrow passages. Rogue waves can be damaging if not engaged in the correct way. The Jackdaw is not only a vessel of transportation, it is the hub from where to switch Edward Keyway’s clothing and send ships on missions to gain goods and rewards. It can be upgraded with plenty of defence and weapons, similarly to how the Aquila was upgraded in AC3. Once fully upgraded it can easily sink Man'o'wars despite being a smaller brig. Legendary ships are a whole different matter though! The Jackdaw is also used to access underwater treasure caves and sunken ships. 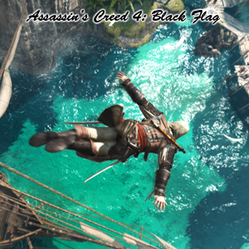 The details are not lacking whatsoever and adds stress to the game when swimming from one diving bell to another to catch air while at the same time looking for treasure and avoiding threats of sharks and lurking morays. The underwater missions become pretty repetitive and/or irritating after a while though. Hacking computers reveals information that could alter the future. The modern day takes place at Abstergo Entertainment, a subsidiary to Abstergo Industries, six months after the conclusion of the Desmond Miles story. Its official business is to offer ancestral experience for recreational use. Abstergo Entertainment has hired a person experiencing the life of Edward Kenway and the footage from the experiences is meant to be used to make the first trailer to promote ancestral experiences. A little bit of lurking and hacking reveals not only the true intent of the project, to find the Observatory, but also the ability to experience ancestral events outside of one's bloodline. I hate to say it but the story is decent at best. It basically depict a self-absorbed man looking for a better life in a morally incorrect environment that, as he goes along, grows a conscious and realizes there are more to life than just rum, ladies and money. There's heavy emphasis on sailing (not a problem) and pirates, and very little emphasis on Templars and ridding the world of them. The rest of the game feels mediocre. Everything, except the shipwreck diving and the harpooning, and of course the historical setting, has been done before. The features just come in a different shape. For instance, upgrading the property of the main character was introduced in Assassin's Creed 2 as a means to increase wealth to further the success of the assassin and has been a recurring feature since. This time there is no purpose of doing an upgrade. Another example is the ability to send assassins on missions that started in Assassin's Creed: Brotherhood and has evolved into sending ships on missions to trade goods in both Assassin's Creed 3 and 4. Playing the game with a faulty controller and succeeding without any major issues speak for the difficulty of the game – it offers challenge but not to the point where it is infuriating. The concept of sneaking and hiding in plain sight is back and doesn't feel old at all. ...and I am still waiting to play a female assassin. The hour-long adventure of Aveline de Grandpré (extra material/DLC) wasn't enough and seemed way too easy. On a positive note, sailing is awesome, and I thoroughly enjoyed the lack of annoying mental patients, begging ladies, bards and obnoxious children on the streets! Can the game be played without playing the previous games? Yes, but for the sake of clarity it is advised to play as many of the previous games as possible. What's your thoughts on the game?